accompanied by a clarification of the level of caution to be observed. established safety practices and standards. All new components are to be provided by Siemens Milltronics Process Instruments Inc. Restrict repair to faulty components only. Do not reuse faulty components. installed, set up, operated, and maintained. may cause interference to several frequency based communications. Note: Always use product in accordance with specifications. Technical data subject to change. MILLTRONICS®is a registered trademark of Siemens Milltronics Process Instruments Inc.
Siemens Milltronics Process Instruments Inc. Measurement and then go to the manual archive listed under the product family. Weighing Systems and then go to the manual archive listed under the product family. (ordered separately) to accurately monitor material levels without material contact. The SITRANS LU01 transmits electronic pulses to each connected ultrasonic transducer. Echomax transducer is used, variable air temperatures are automatically compensated. homogeneous atmospheres other than air. outstanding measurement accuracy, usually within 0.25% of range. displayed on the LCD (liquid crystal display). alarms and/or operate remote monitoring equipment and/or process control equipment. Remote I/O, Modbus® RTU, and DeviceNetTM. through optional Dolphin Plus software or SmartLinx. and can be removed when not in use. Large digits for Reading and programming value displays. interface permit removal on programming completion. (point) per second scanning speed capability. one hour and updated immediately on power resumption. Any operator programmable feature may be accessed directly. Scroll forward, scroll back, to key features. Select level, space, or distance operation. of some configuration examples to which the SITRANS LU01 may be applied. Failsafe options for process control equipment activation. Fill out Programming chart on page 104 or record parameters using Dolphin Plus. • 1 point per SITRANS LU01 max. 0.3 m (1 ft) to 60 m (200 ft) max. 0.17% / °C deviation from programmed temperature. (P006) plus any range extension (P801). • Refer to the associated instruction manual. Refer to associated product documentation. • RG-62 A/U (or equivalent), 365 m (1,200 ft) max. Communications: SmartLinx, RS-485, RS-232, bipolar. other wiring, (except TS-3 temperature sensor wiring, if applicable). Leave sufficient room to swing unit lid open and have clear access. the SITRANS LU01 and associated equipment. 1. Loosen the 6 enclosure lid (captivated) screws and swing the lid open. 6. Reinstall the circuit board assembly. suitable location for conduit entrances. Use water tight conduit hubs to maintain the enclosure rating. diameter, access under lid (4 places). grounding type bushings and jumpers. stances. 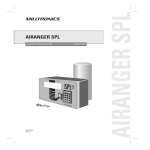 Please check the appropriate transducer manual for details. Connect all associated equipment cable shields to the SITRANS LU01 shield connections. elsewhere. Insulate or tape cable shields at all shield junctions to prevent ground loops. •All field wiring must have insulation suitable for at least 250V. live parts and wiring having insulation suitable for at least 250V. settings prior to replacing the LCD card or closing the SITRANS LU01 lid. Wire in the SmartLinx card according to SmartLinx Manual. Replace the LCD card and secure in place using the screws removed in Step 1. Remove the 4 LCD card screws and the card itself. Remove the one dummy card screw and the card itself. Note: Use TS-3 temperature sensor only. and shown via LED on the motherboard. Ground shield at one end only. Refer to the appropriate SmartLinx manual for installation and wiring. Mount the level monitors together in one cabinet. Interconnect the SYNC terminals of the level monitors to be synchronized. ultrasonic level monitors, contact Siemens Milltronics or your local distributor. Note: Before making the power connection, ensure proper voltage selection. within easy reach of the operator. the ground (earth) wire disconnected. until satisfactory operation is verified. and is kept there with a magnet. Number. The Index refers to the Relay Number as identified by the Index Type indicators. Parameter Numbers have a preset Parameter Value for each Index Number. Program the SITRANS LU01 to obtain the desired RUN mode operation. Value (as well as a variety of other programming information) may be viewed. all indicators are not displayed at any given time. the programmable feature the Parameter Value refers to. the relay the Parameter Value refers to. the current value of the Parameter Number for the Index number displayed. indicates the Parameter Value is displayed in percent. accept values out of range. indicates the Parameter Value may be scroll accessed. indicates PROGRAM mode is accessed. DISPLAY: shift access to Index, Parameter Number, or Parameter Value display. NUMBERS: enter the numeric value into the accessed display. DECIMAL POINT: enter a decimal point (moves Profile and TVT Pointers left). ARROW UP: increase the accessed display value. ARROW DOWN: decrease the accessed display value. Upon initial power application, the SITRANS LU01 displays OFF. Secure the enclosure lid using the 6 captivated screws. Place the infrared programmer in the enclosure lid recess. PROGRAM mode for an extended period. either accepting or replacing it with a valid value. to select the Parameter Number field. After the third digit is entered, the parameter value is shown. as required to underline the Index display field. (P000) and enter the security code (See Programming Security). either accepting or replacing it with a valid value. .
To alter the Parameter Value for all Indices at once, select Index 00.
displayed is acceptable, no entry is required. To reset all parameters to preset values, use Master Reset (P999). replacement, or whenever complete reprogramming is required. Parameter values indicating status only. They cannot be altered. Parameter values common to all inputs and outputs on the SITRANS LU01. To set all indexed values for a parameter to the same value, use index 0.
parameter to secure the SITRANS LU01. In RUN mode, the SITRANS LU01 detects material levels and provides control functions. The SITRANS LU01 automatically starts in RUN mode when power is applied. the current display linked to transducer measurement. displays the level, space, or distance (flashes error messages, if any). the Reading is in percent. indicates level has risen above 80% (and not yet fallen below 75%). indicates level has fallen below 20% (and not yet risen above 25%). indicates the vessel is filling. indicates the vessel is emptying. indicates the SITRANS LU01 is transmitting data to the Peripheral Communications terminals. indicates the relays programmed for operation. indicates the relay is de-energized (alarm is activated). indicates operating conditions are good and the Reading is reliable. indicates operating conditions are poor and the Reading may be incorrect. In RUN mode, the following programmer keys perform the identified functions. selects the Auxiliary Reading "mA output value". selects the Auxiliary Reading "vessel atmosphere temperature". selects the Auxiliary Reading "rate of material level change". selects the Auxiliary Reading "failsafe time left" (in percent). selects the Auxiliary Reading "parameter value" (Key in any Parameter Number). selects the Auxiliary Reading "distance" (material level to transducer face). stops/starts the Point Number auto display scroll. LU01 takes measurements and calculates the Reading. If an alarm symbol is displayed, the corresponding relay is de-energized. * Objects close to the transducer face (0%) are not detectable. * Objects close to the transducer face (4 mA) are not detectable. begins to fall toward 0 until the next valid measurement is made. If the Failsafe Time Left reaches 0, the SITRANS LU01 flashes LOE in the Reading display. All associated data is supplied to the Peripheral Communications terminals (27 and 28). Monitor system performance carefully, under all anticipated operating conditions. alterations to the Programming Charts in the back of this instruction manual. (Altered Parameter Values may be scroll accessed). No further action is required. The SITRANS LU01 will continue performing reliably, with little or no maintenance. Troubleshooting Guide on page 99.
proceed to Application Parameters on page 32. Measurement simulation to verify programming. are marked as view only in the Parameter values. as required to underline the Parameter Number display field. Chart for future reference,in case complete reprogramming is required. enter the security code (See Programming Security). the parameter values which are entered into the unit. values, refer to Master Reset (P999) on page 84.
value which can be discovered by unauthorized personnel. 1954. You cannot scroll to this parameter. Sets the type of measurement required for the application. Determines level change reaction speed. higher accuracy. Faster settings allow for more level fluctuations. Specifies the Siemens Milltronics transducer connected to the unit. Specifies measurement units used for dimensional values. Changing this value automatically changes the units displayed for many parameters. Existing values are converted and do not have to be re-entered. Enter distance in units (P005) from the face of the transducer to the process empty point. Setting this value also sets Span (P007) unless Span was already set to another value. For distance operation (P001=3), Span is preset to Empty. Sets the range level to be measured. (P006), unless it is altered manually. For distance operation (P001 = 3), Span is preset to the Empty value (P006). Enter the Tank Shape value matching the monitored vessel or wet well. volumetric units, see Maximum Volume (P051). Empty (P006) and Span (P007). span and is scaled according to the Tank Shape (P050) value. Note: Make sure selected chosen units allow LCD volume display. Dimension A as used in P050 Tank Shape. Dimension L as used in P050 Tank Shape. Enter the values to set the breakpoints. the volume based on segments. to display the index symbol. For each index enter a volume. Ensure that each volume corresponds to the same index for P055. For more on Volume Characterization, go to page 87. SITRANS LU01 can make the level-to-volume calculations. Ensure that each volume corresponds to the same index for P054. Defines the maximum number of decimal places used on the LCD. decimal places to that shown at 100%. If 100% is 15 m, use two decimal places for sample readings of 15.00 or 12.15. Multiplies the current value by the specified amount to allow for scaling. reservoir contains 100 litres per vertical meter, use 100 to get the reading in litres. efficiency) are used. To calculate true volumes see Volume (P050 to P055). display purposes only. All control measurements are still referenced to Empty. the Reading, Bar Graph, mA outputs, and relays at their last known values. The time for invalid measurements to elapse before Failsafe State activates. mA outputs are held at last known values and the Failsafe Timer is activated. P003) and the timer resets. the Failsafe Material Level (P071) as restricted by Failsafe Advance (P072). If the timer expires due to a measurement difficulty, LOE flashes in the Reading display. The material level is reported based on P071 Failsafe Material Level. activate as defined by the programming). transducer terminal connections or wrong Transducer (P004) entered. enough to avoid false alarms. Only use No Delay (0.0 Minutes) for testing. The material level reported when a Failsafe State is initiated. to display the Auxiliary Function symbol. to scroll to the desired option. Alarm relays have P129 = OFF and so react to the Failsafe Material Level. Failsafe mode regardless of the Failsafe Material Level. The SITRANS LU01 has four relays (or digital outputs) used to control devices and alarms. through software and each parameter is indexed to the relays. extensive list of presets in P100 (Preset Applications). indicators are displayed and the allocated relay(s) de-energize. Alarm and Relay Status indicators extinguish, and the allocated relay(s) energize. Span (P007) as referenced to Empty (P006). required to display the % symbol. then change the required parameters to make the task more efficient. Setpoints are set up in P112 and P113. Each relay is triggered by one or more setpoints. The setpoints can be based on absolute level (P112, P113) or rate of change (P702, P703). Each control function specifies which setpoints are required. Relay status during a measurement difficulty is dependent upon Failsafe programming. is held at last known material levels until a valid measurement is made. Relay Set Up value is altered. . Note: Programming the relays independently is the most common method used. Enter the Low Alarm material level for the index displayed. . Enter the Low Low Alarm material level for the index displayed, (Relay Set Up 3 or 4 only)..
Ch is displayed if a Custom Relay Parameter was previously operator altered. Enter the High Alarm material level for the index displayed. .
Sets the control algorithm used to trip the relay. display changes to the Relay Number (corresponding to the SITRANS LU01 terminals). Use zero 0 (preset) to disable control of the indexed relay. of Operation Mode selection (POO1). The relay designation is not displayed but is included in the data message. communications the parameter values are mapped to different numbers. See the relevant SmartLinx manual for Modbus information. values are entered in degrees Celsius (°C). is entered for a filling rate alarm; negative for emptying. Note: Relay ON and Relay OFF setpoint values cannot be exactly equal. Sets the process point at which the relay returns to its NORMAL state. to Span (P007), even when another reading, such as volume, is shown on the LCD. The distance above and below the bound alarm setpoints. Sets the process point at which the relay changes from its NORMAL state. setpoints as shown in the figure. Sets the failsafe operation per relay to allow for more flexible programming. Use this for operations independent of the Failsafe Material Level (P070). any other relay control function. to scroll through the failsafe options. Determines the mA output range. either 3 or 4 is selected, then the output is inversely proportional. Alters the mA output/measurement relationship. Displays current mA output value. does not include adjustments made using Trim features (P214 / P215). Index Number as its input source (see P201). displayed in the Index field. (P007) as referenced to Empty (P006). Enter the volume in Max Volume (P051) units or as a percent of Max Volume. is displayed before attempting to enter a % value. Sets the process level corresponding to the 0 or 4mA value. Enter the value (in applicable units or %) to correspond to 0 or 4 mA. Sets the process level that corresponds to the 20 mA value. Enter the value (in applicable units or %) to correspond to 20 mA. should suit the input limit requirements of the external device. Sets the minimum mA output value (in mA) to be produced. Sets the maximum mA output value (in mA) to be produced. Calibrates the 4 mA output. Adjust this value so the device indicates 4.000 mA when P214 is accessed. Calibrates the 20 mA output. Adjust this value so the device indicates 20.00 mA when P215 is accessed. Use for failsafe operation, independent of the Failsafe Material Level (P071). mA output responds to Failsafe Material Level (P071). to scroll access the failsafe options. when the desired option displayed. if mA output is allocated to a transducer (P201 = 1 to 4). keys to reset the log after a short circuit on the transducer wiring. technicians familiar with Siemens Milltronics echo processing techniques. automatically (P331 et al) for viewing at a later time using Dolphin Plus or an oscilloscope. overwritten. All records are automatically deleted in the event of a power interruption. observed when changing an echo parameter. Records profiles for later viewing. twice to highlight the index field. The field shows two underscores _ _. Type the index number. The profile record information is shown. to scroll through the records. internal scope buffer for display. parameter to select the transducer number. key to enter display auxiliary mode. address. The value returns to - - - -. Use to enable/disable the Auto Profile Record function. Record can be saved (subject to all other restrictions). for an Auto Profile Record. current level (subject to all other restrictions). boundaries for Auto Profile Records to be saved. Limits Auto Profile Records from being saved unless extended LOE occurs. LOE is not required for an Auto Profile Record to be saved. View the date of manufacture of this SITRANS LU01 unit. View the number of days this SITRANS LU01 has been in operation. on a regular basis will not have an accurate value. The number of times power has been applied since the Date Of Manufacture. Adjusts the measurements by a fixed amount. Sound Velocity: Adjusts speed of sound and changes the measurement calculations. Do Offset calibration at any steady level unless a Sound Velocity calibration is also done. Calibrates Empty (P006) if the reported level is consistently high or low by a fixed amount. Begin with a steady level. to display the calculated reading. 2. Repeat Step One at least five times to verify repeatability. 3. Measure the actual reading (use tape measure). 4. Enter the actual value. stored in Offset Correction (P652). Changes the speed of sound constant. For best results, calibrate with the level at a known value near empty. 1. Allow sufficient time for the vapor concentration to stabilize. 3. Repeat Step Two at least five times to verify repeatability. 4. Measure the actual reading (e.g. with a tape measure). 5. Enter the actual value. are different from when the last sound velocity calibration was performed. The value altered when an Offset Calibration is performed. added to the Reading before display. Calibration (P651). The units used are m/s if P005 = 1, 2, or 3, or ft/s if P005 = 4 or 5. This value is used to automatically calculate Sound Velocity (P653). beam atmosphere is air (344.1 m/s or 1129 ft/s). The units used are m/s if P005 = 1, 2, or 3, or ft/s if P005 = 4 or 5. Source of the temperature reading used to adjust the speed of sound. not have an internal temperature sensor, the Temp Fixed (P661) value is used. Use this feature if a temperature sensing device is not used. the temperature varies with distance from the transducer, enter the average temperature. View the transducer temperature in °C. is pressed in RUN mode. temperature measured. If Temp Source is set to Fixed Temp, the P661 value is displayed. These parameters determine how material level changes are reported. to a higher Failsafe Material Level, P071). to a lower Failsafe Material Level, P071). The fill rate required to activate the LCD Filling indicator ( ). the Max Fill Rate (P700). The empty rate required to activate the LCD Emptying indicator ( ). the Max Empty Rate (P701). Damps Rate Value (P707) fluctuations. This is automatically altered along with Maximum Process Speed (P003). Distance (P706). Alternatively, these parameter values may be altered independently. The material level change (in metres) to initiate a Rate Value update. The rate of material level change (in Units (P005) or % of Span (P007) per minute). A negative rate indicates the vessel is emptying. splashing liquid surface) within the Echo Lock Window (P713). (P003) is altered. The higher the value entered, the greater the fluctuation stabilized. Use this feature to select the measurement verification process. Echo Lock Window (P713) must meet the sampling criterion (P712). window. The window then returns to its normal width. as the new reading (for Echo Lock P711 values: 1 or 2). Adjusts the size of the Echo Lock Window. (P711) before the reading is updated. values the window becomes wider. Enables the System Sync on the terminal block. together on the Sync terminal. The delay, in seconds, between measurements from transducer points . Process Speed (P003) is altered. The delay, in seconds, between transducer shots. is installed for redundancy, this value should be 0. View the elapsed time (in seconds) since the point displayed was last scanned. This may be viewed as an Auxiliary Reading in the RUN mode. Readings until another Auxiliary Reading is selected or programming mode is entered. See the Keypad section on page 24 for RUN mode auxiliary readings. to access the OFF or HOLd option desired. reset to the parameter defined here. Adjusts the Point Number display scroll speed. Use this feature to adjust the delay before the display advances to the next Point Number. Display scrolling is independent from transducer scanning. Use this feature to select the parameter scroll access option desired. to tag / untag any accessed parameter. indicate the parameter accessed is tagged. default settings cannot be untagged. Use this feature to select the SITRANS LU01 to communication message format. if comm port is not used, OFF increases LU01 processing speed. cable runs typical of 500 m or more. card. Refer to the SmartLinx documentation to determine if any of them are used. The communication rate with the master device. connected hardware and protocol used. These parameters are used to test and debug a SmartLinx card (if installed). The results of ongoing hardware tests in the communications circuitry. A count that increments by 1 each time a bus error (P791) is reported..
Error count; provide this number to your Siemens Milltronics representative for troubleshooting. instruction manual for a full description of this parameter. The space near the transducer face which cannot be measured. Indicates if an error condition is occuring on the bus. Please note that changing the Near Blanking cannot correct measurement problems. Ensure that Span (P007) < Empty (P006) minus Near Blanking (P800). Used if incorrect level is reporated (when material level is lower than Empty, P006). the transducer to vessel bottom distance. Used when the transducer is expected to be submerged on occasion. advances the reading to the highest level and operates displays and outputs accordingly. This feature is effective for when power is returned while the transducer is submerged. Determines what type of ultrasonic shots are fired. Determines which echoes are evaluated by software. Note: The decimal point is replaced with a colon (:) on the display. Displays the echo confidence of the measurement echo from the last shot. short shot confidence value, (long shot not used). long shot confidence value, (short shot not used). short and long shot confidence values (both used). transducer cable is open or short circuited. no shots were processed for Sonic Intelligence evaluation. within the Short Shot Range (P852). Displays the average and peak ambient noise (in dB above 1 μV rms) being processed. Troubleshooting Section on page 99. Use this feature to monitor the effects of Echo Processing changes. Connect an oscilloscope to Display Board TP4, TP5, and TP6. Amplitude = 1 V / div. Note: Use of an analog oscilloscope is preferred over a digital oscilloscope. Any combination of the following Scope Displays is available. to access the desired Reading display symbols. with the desired display symbols displayed. signal display OFF, and a 1 turns the display ON. Captures echo profiles for display on an oscilloscope. The time (in ms) from the transmit pulse to the processed echo. the nearest acceptable Echo Profile point. Press P or P to move the Profile Pointer to the left or right respectively. scope display automatically changes back to include the Echo Lock Window. The time (in ms) from the transmit pulse to the Profile Pointer. The distance between the transducer face and the Profile Pointer. Chooses the algorithm to generate the measured value from the profile. when the required algorithm is displayed. The amplitude (in dB above 1 μV) of the Echo Profile at the Pointer position. Dampens spikes in the echo profile to reduce false readings. Use P821 if interference spikes are on the long shot Echo Profile display. Filters out echoes of a specific width. Enter width of false echo in msec. in, the nearest acceptable value is entered. Smoothes jagged peaks in the echo profile. Reforms fragmented echoes into one. The point on the primary echo on which the measured value is based. the leading edge of the true echo on the Echo Profile. Echo Profile at the sharpest rising portion of the Echo Profile representing the true echo. This value is preset to 90% when P002=1 (Liquid) or 50% when P002=2 (Solid). Advanced TVT control applies to long shots only. Selects the TVT Curve used. Select the TVT type which gives the highest confidence (P805) under all level conditions. Turns the TVT Shaper ON or OFF. OFF while monitoring the effect to pick up the true echo. Allows manual adjustment of the TVT curve. TVT Curve Pointer. See P810 Scope Displays on page 71 for more information. Confirm that P831, TVT shaper, is on. to select the Auxiliary function. curve pointer right or left respectively. to change the bias value of the breakpoint, –50 to 50.
echoes) near the start of the Echo Profile. Enter the minimum TVT Curve start point (in dB above 1 μV rms). than desired into the measurement range. up true echoes) near the start of the Echo Profile. to the TVT Curve baseline. Enter the minimum slope (in dB/s) for the middle of the TVT Curve. TVT type is set to TVT slopes (P830=6). to update the scope display with the new TVT. Note: These parameters are for Siemens Milltronics service personnel only. The number of short shots to be fired (and results averaged) per transmit pulse. Enter the number of long shots to be fired (and results averaged) per transmit pulse. This value is automatically altered by Maximum Process Speed (P003). Adjust the short shot transmit pulse frequency (in kHz). This feature is automatically altered when Transducer (P004) is altered. Adjust the long shot transmit pulse frequency (in kHz). Adjust the width (in ms) of the short shot transmit pulse. Adjust the width (in ms) of the long shot transmit pulse. short and long shots are evaluated (see Shot Mode, P803). Enter the maximum distance in Units (P005) to be measured using short shot echoes. View the EPROM Rev. #. to activate the SITRANS LU01 memory test. to put the CPU into an infinite loop to test the watchdog timer. to activate the display test. All LCD segments and symbols are temporarily displayed. P004 Transducer) for the Point Number displayed. to test the SITRANS LU01 communications circuitry. displayed, repeate the test (the first test performed sets up the auto polarity function). is reset. Programming is kept and the unit responds as if there had been a power failure. On successful test completion, PASS is displayed. Otherwise, FAIL is displayed. Access this parameter to display the current state of the specified relay. corresponding to the specific relay state desired. Access this parameter to display the current value of the mA output. immediately assumes the value entered regardless of any restrictions programmed. Err is displayed if the transducer is not equipped with an internal temperature sensor. Access this parameter to display the temperature in °C (as monitored by the TS-3). OPEn is displayed if a TS-3 is not connected. (repeat five times to overcome Echo Lock, P711). to activate control relays during simulation. The simulation starts at level = 0, unless a specific level was entered. key increases (or decreases) the simulated rate of rise (or fall) to 4% of Span per second. selected, and the material level is displayed in the Auxiliary Reading field. Corresponds to the final reading after all programming is applied. The distance between the monitored surface and Span (P007). The distance between the monitored surface and the transducer face. output value accordingly, and will set the relay status accordingly. The calculated vessel capacity in Max Volume (P051) or % of Max Volume. as required to display in Max. Volume units. The distance between the surface and the transducer face. This feature resets all parameters to original values. CAUTION: Be careful when using this feature. All data will be reset. For convenience, be sure to record the values you want to re-enter. the transmit pulse to the Transducer(s) connected to the SITRANS LU01 terminals. profile (digitized signal representing the echo signal received). profile must meet to be considered the true echo (echo reflected by the intended target). Threshold (P804) and Short Shot Floor (P851) are automatically disregarded. selected as the true echo. Lock (P711) requirements are satisfied. range are defined by parameters P803 and P840 to P852. time period. The result (round trip distance) is divided by 2.
distance calculation is 344.1 m/s (1129 ft/s). sunlight, use a sun shield or a separate TS-3 temperature sensor. the vessels and the resultant Velocity (P653) entered directly for the other vessel. anticipated Velocity (P653) may be entered directly. The SITRANS LU01 provides a variety of volume calculation features (P050 to P055). provided by the vessel fabricator (or create one based on the vessel dimensions). more breakpoints entered, the greater the volume calculation accuracy. required to maintain optimum measurement accuracy. breakpoints are entered along the arc, for best volume calculation accuracy. This volume calculation creates a cubic spline approximation of the level/volume curve. This option provides best results if the curve is non-linear, and there are no sharp angles. and after any sharp angle (as well as 1 breakpoint exactly at the angle) on the curve. designed to exceed the most demanding installation requirements. alteration automatically changes the independently altered value. Note: Slower Max. Process Speed provides greater measurement reliability. Scan Delay and Shot Delay values. SITRANS LU01 response to material level changes as in the table that follows. fastest Measurement Response (P003) selected for Point Number 1or 2.
meet the needs of specific process measurement requirements. measurement requirements may be more easily recognized. Level (or Material Volume) Measurement for a single vessel. Space (or Remaining Vessel Capacity) Measurement for a single vessel. This is the most common application of the SITRANS LU01 level monitor. one 30 m high cement silo is to be monitored. the maximum vessel filling rate is 0.08 m per minute. filling equipment is to be automatically deactivated at 27 m.
an XLT-30 transducer is mounted with its face flush with the top of the vessel. a TS-3 temperature sensor is connected to the Temp Sensor 1 terminals. Enter "1" for slow (0.1 m/min). No entry required, (preset for metres). No entry required, (preset to 29.01 metres). Enter "HI" for advance to Span on "LOE". No entry required. (preset to restricted). Enter "25" for High Alarm at 25.00 m.
Enter "10" for Low Alarm at 10.00 m.
Enter "27" for High High Alarm at 27.00 m.
Enter "5" for Low Low Alarm at 5.000 m.
connect a high alarm indicator to Relay #1 (see P100 = 4). connect a low alarm indicator to Relay #2.
connect a low low alarm indicator to Relay # 4. (Note that relays are de-energized in power off and alarm conditions). reported level = 6.00 m.
reported level = 10.00 m.
reported level = 25.00 m.
reported level = 27.00 m.
the vessel is cylindrically shaped with a flat bottom. the vessel volume for Empty to 29.01 m (Span) is 1457 m3. Enter "1" for vertical cylinder with flat bottom. Enter "1457" for 1457 m3. Now in the RUN mode the Reading represents material volume in m3. importance to the installation than the actual material level. the maximum vessel filling rate is 1 ft per minute (slower at mid level). if the difficulty doesn't subside, the mA output must immediately assume 22.00 mA. a TS-3 temperature sensor is mounted in the vessel to monitor liquid temperature. No entry required (preset for liquid). Enter "3" for 3 ft (vessel diameter). No entry required, (preset by P003). Enter "22" for 22.00 mA. Enter "20.2" for 20.20 mA. Enter "5" for average XCT-8 and TS-3 temperatures. be performed to verify mA output programming). Enter "7"* for horizontal cylinder with parabolic ends. Enter "1.5" for 1.5 ft (the horizontal length of one parabolic end). material to Full in feet) set the mA Function (P201) to 2.
applied to process measurement requirements. measurement or determination of presence vs. lack of presence of an object is desired. ways of using the SITRANS LU01 to monitor specific processes. paper, water, and waste water industries. requirement, please contact Siemens Milltronics or your local distributor. connection made at the SITRANS LU01, either RS-232, RS-485 or bipolar current loop. no parity, and 1 stop bit. between each message field (except immediately preceding the "End of Message"
housekeeping practices in and around the area of the enclosure are recommended. necessary) before installing the programmer. maximum system performance, a schedule of regular cleaning should be adopted. The user is responsible for all changes and repairs made to the device. Do not re-use faulty components. Check Power supply, wiring, and voltage switch. Repair or replace as necessary. See Technical Reference / Measurebilization. use an ultrasonic/temperature transducer or a TS-3 temperature sensor. See Technical Reference Sound Velocity. Material (object) surface monitored is within the maximum range of the transducer. Transducer (P004) value matches the transducer used. Transducer is located and aimed properly. complete, set the transducer aiming at the best angle for all levels. Enhancement Parameters Short Shot Frequency, P840 and Long Shot Frequency, P841). reflective surface representative of an empty vessel. optimize aiming and frequency again. LU01, (see Enhancement Parameters Scope Displays, P810). Application Examples \ Example 1 - Level Measurement. Transducer sound beam is free from obstruction. Transducer is not in contact with any metal object. Material agitator (if used) is on while the SITRANS LU01 is operating. from (or remove) the obstruction. transducer from a resonant metallic surface. open end of the standpipe at a 45° angle. (farther away from) the nearest object to be monitored. Material (object) surface monitored, is not beyond the transducers maximum range. Material is not falling in the transducer sound beam. Material (P002) value matches the material monitored. Measurement Response (P003) is not set too fast. Transducer (P004) type entered matches the transducer used. distance, increase Range Extension (P801) as required. well (contact Milltronics or your local distributor). those of) another ultrasonic level monitor, see Level System Sync (P726). condition disappears, move the SITRANS LU01 to another location. Increase the Confidence Threshold (small amounts at a time) while observing the results. If performance is not improved return the Confidence Threshold to the preset value. the true echo has jagged peaks, use Reform Echo (P823). the vessel top is domed), use the first Algorithm. record values on a seperate sheet. SC 3785 - Trevi S.p.A.